You might feel embarrassed or insecure if you have uneven or crooked teeth. Unfortunately for many people the solution – braces – can also cause confidence issues. Here are a few tips and tricks to help you to feel more confident while wearing braces. Remind yourself that braces are cool. OK, we know what you are thinking: that’s a stretch! But it’s true, braces are incredible! Braces are intricate little mechanisms that quietly work away at straightening your teeth, without you having to do anything. You might not love how your braces look, but you've got to admit, they’re pretty cool. If you're feeling less then confident in your new braces, keep on reminding yourself: they’re only temporary and the end result will be worth it! Keep smiling, knowing that your teeth are getting straighter and straighter every second. Think of your braces as accessories. For months or maybe years, your braces are going to be a part of your appearance. 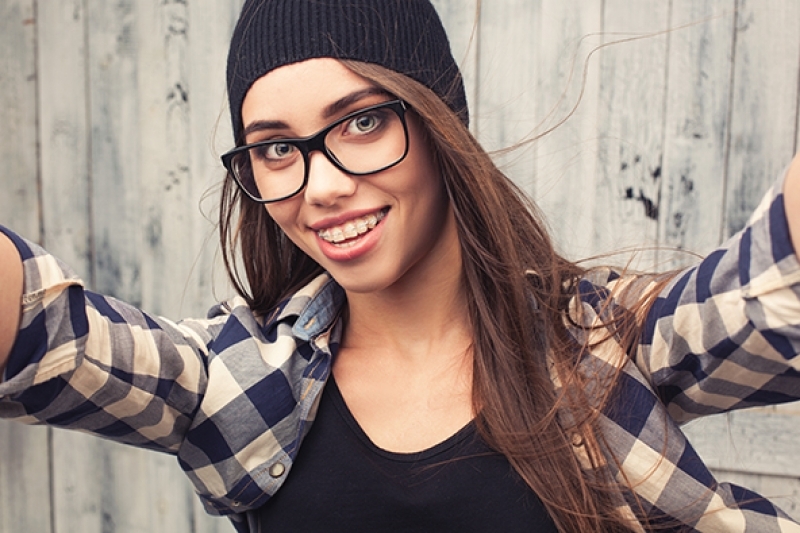 Think of your braces as an accessory, much like a necklace or earrings. Rather than trying to hide your braces choose colourful elastics or bright lipsticks to highlight your braces. Consider clear or lingual braces. If you don't feel that you're confident enough to smile with metal braces on, speak to your orthodontist about more inconspicuous options such as Invisalign clear orthodontic aligners, or lingual braces (which are attached to the backs of the teeth). Fake it until you make it! Whether you feel confident about your braces or not, just smile anyway! The more you avoid smiling, in an awkward attempt to hide your braces, the less confident you’ll feel and look. People will know you have braces whether you smile or not, so you might as well go for it! The more you smile with braces the less self-conscious you will become, and the more comfortable and confident you’ll begin to feel . For more information about overcoming your insecurities about your braces, contact our Langley orthodontists at Austin Heights Orthodontics any time.